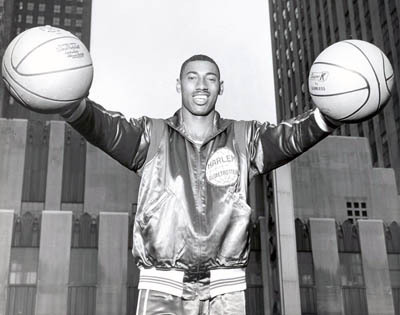 Wilt Chamberlain frustrated with the triple and quadruple team defenses employed by college basketball teams and not permitted to play in the NBA yet, spent the 1958-59 basketball season with the most popular team in the world, the Harlem Globetrotters. The team embarked on a historic trip to the Soviet Union in the midst of the Cold War between the U.S. and Russia. This is just one of the stories highlighted during Black History Month on ESPN. The All Black Globetrotters were a competitive team (not the strictly entertainers they are today) and better than all other NBA clubs not named the Boston Celtics with Bill Russell. The NBA employed a quota system and only allowed for one or two Black players on a team at the time. ESPN will begin a month-long commemoration of Black History Month that will include a televised special, a musical remake with artist Aloe Blacc and other content across print, digital and television platforms. As part of a “Black Athletes Making History” theme that launched with content around Martin Luther King Day, ESPN’s Black History Month content will be highlighted by Unapologetic: The Black Female Athlete, a television special airing Sunday, Feb. 24, at 10 p.m. ET on ESPN2. The program is presented by The Undefeated, ESPN’s content initiative exploring the intersections of sports, race and culture. The thought-provoking special highlights the imagery and characterizations of black female athletes over time, their challenges and achievements. The special includes portions of a panel discussion held at Morgan State University and is hosted by professional softball phenom A.J. Andrews. A series of video vignettes featuring well-known athletes and coaches launched across ESPN platforms prior to the MLK Day weekend and will continue through Black History Month. The vignettes tell the story of how sports figures have used their platforms to improve their communities and world. Participants include David Robinson, Derek Jeter, Warrick Dunn, Kemba Walker and many others. The 16th Man — When the 50-year-old policies and entrenched injustices of apartheid in South Africa were finally overthrown in 1994, Nelson Mandela’s new government began rebuilding a nation badly in need of racial unity. So the world was watching when South Africa played host to the 1995 Rugby World Cup. Straight Outta LA — In 1982, Oakland Raiders owner Al Davis beat the NFL in court and moved his team from Oakland to Los Angeles. With a squad as colorful as its owner, the Raiders captivated a large number of black and Hispanic fans in L.A. at a time when gang warfare, immigration and the real estate boom were rapidly changing the city. From Harlem With Love – It’s 1959 and the Cold War rages on. In the midst of this intense psychological warfare, a group of heroes step forward, not in a warzone, but on a basketball court. This is the tale of the Harlem Globetrotters and their historic trip to the Soviet Union. Chubbtown — The story of the historic hometown of NFL running back Nick Chubb. A very small community in the North Georgia mountains, Chubbtown was formed by Chubb’s ancestors — free black families who settled in the area during the Civil War. Mike Conley and Elliot Perry Visit the Lorraine Motel – The Undefeated’s Marc Spears tours the National Civil Rights Museum with two Memphis basketball greats. 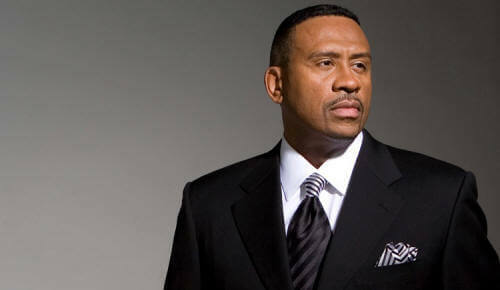 My Moment In Black – ESPN personalities recount a personal moment in black history that made an imprint. Maame Biney, on how she strives to make her Ghanaian parents proud while managing her speed skating career. A conversation with sisters and WNBA players Nneka and Chiney Ogwumike. Ballerina Michaela DePrince on learning to love Sierra Leon, where she was born, after fleeing the country during a decade-long civil war and being adopted by an American family. Essay: My journey from Nigeria, the UK and Storrs by Divine Oladipo, a track and field athlete at UCONN. ESPN the Magazine – The February issue of ESPN the Magazine, “The Boardroom: Making of a Mogul”, will feature a cover story on one of the NBA’s most prominent players who is expanding his brand in multiple directions. The content of the issue will focus on the way athletes continue to diversify their time and interests off the court. SEC Network – ESPN college basketball analyst Carolyn Peck and South Carolina head women’s basketball coach Dawn Staley will sit down for A Championship Conversation, highlighting Peck’s and Staley’s places in history as the only two black women to coach their teams to an NCAA women’s basketball title. The duo will delve into the challenges Staley faced building a program in the South, reflect on the Gamecocks’ 2016-17 NCAA Championship run, and consider what Staley and South Carolina’s win means for opportunities for other black women in the coaching profession. More details, including air date and time, will be announced in the coming weeks. The latest episode of Homecoming, hosted by SEC Network’s Paul Finebaum, debuts on Tuesday, Feb. 5, at 6:30 p.m. ET. Homecoming airs periodically throughout the year and features notable SEC alumni returning to their schools. In the Feb. 5 episode, Finebaum goes in-depth with three-time GRAMMY Award winner and South Carolina alum Darius Rucker. The Charleston, S.C., native made history in 2008 becoming the first African American artist to take home the Country Music Association trophy for New Artist of the Year. In addition, a series of vignettes celebrating the diversity across the SEC will air throughout the month on the network. Longhorn Network – In May 2018, Longhorn volleyball player Haley Eckerman made a historical statement during the USA Volleyball Open National Championships by forming Team Dream, the first team comprised of all African American women to compete together in the Open Division. This Longhorn Network feature dives into the inspiration behind the creation of the team, the impact they hoped to make and obstacles they had to overcome on their path to winning the National Championship. The feature will debut on Thursday, Feb. 7, at 8 p.m. as part of Longhorn Extra: This Week. ESPN Classic – ESPN Classic will air an array of classic games celebrating the influence and accomplishments of African Americans in sports during the month of February. ESPN PULSE – ESPN’s African American employee resource group, PULSE, will celebrate the month with a series of internal events across the country focusing on both commemoration and education, as well as a special day of service to engage local youth in joint volunteer efforts with Team ESPN and Disney VoluntEARS.